SEOUL, May 24 (Yonhap) — From an immortal god who falls in love with a human, to a woman doomed to read people’s life span, including hers; and from a soul who “rents out” someone else’s body, to a reincarnated writer — there is no lack of fantasy series on Korean TV. In the latest one, “Sketch: The Hand that Paints Tomorrow,” detective Yoo Si-hyun is born with the natural ability to see what will happen in 72 hours and sketch out the images she sees in her mind’s eye. There also a mysterious man named Jang Tae-jun, who foresees the future more graphically than the detective does. 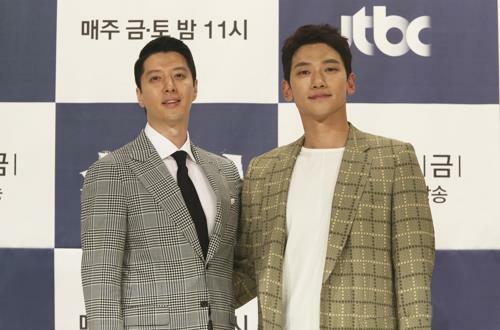 “While the drama has a fantastical setting, what we really focus on is the realistic description and storytelling that our audience can sympathize with,” producer Im Tae-woo said during a press event in Seoul on Thursday. “Our homework is how we will deliver the characters’ emotions more realistically and how the drama depicts the truth about society,” he added. The story revolves around two men who, after losing their loved ones, set out on a painful journey to find the respective killers. During the process, they take different approaches to fighting for justice. Singer-actor Jung Ji-hoon, 36, better known by his stage name Rain, plays Kang Dong-soo, an ace detective armed with excellent intuition and ability. He joins a secret team in order to catch the criminal. Lee Dong-gun, 38, takes the role of Sergeant First Class Kim Do-jin, a member of a special operations command who seeks revenge for the death of his wife. While searching for the truth behind the death, he teams up with the mysterious Jang (played by Jung Jin-young) to stop a crime from happening by killing the criminal in advance. It is the second time Jung and Lee have appeared together in a drama, the first being KBS 2TV’s “Sang Doo! Let’s Go To School” in 2003. When reading the script, Jung said he was surprised to find how intense the action scenes were. “Every episode feels like an (action) film. I thought myself, ‘No, I won’t do it.’ But then, I couldn’t stop thinking about the story,” he said. “While shooting the first action scene, I immediately regretted having taken the role,” Jung said half-jokingly, adding that he wished he had played Kim Do-jin. Asked about his character, Jung declined to elaborate, saying an answer would enter into spoiler territory. But the producer answered it on his behalf. The Friday-Saturday drama succeeds “Something in the Rain,” also known as “Pretty Sister Who Buys Me Food,” and is set to premiere on JTBC on Friday.